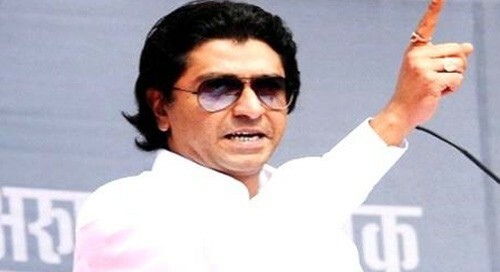 Nanded (Maharashtra), April 12 (IANS) In a blistering attack on Prime Minister Narendra Modi, Maharashtra Navnirman Sena (MNS) President Raj Thackeray said on Friday that the term 'Pradhan Sevak was first coined by Indias first Prime Minister Jawaharlal Nehru. He said that at the Nehru Memorial Museum in Teen Murti Bhavan in New Delhi, there is a plaque in which Pandit Nehru's quote is prominently embossed: "Is desh ki janta hame Pradhan Mantri na kahe, pratham sevak kahe." "But he (Modi) has merely changed ï¿½pratham sevak' to ï¿½pradhan sevak'," Thackery pointed out amidst thunderous applause at regular intervals during his campaign speech for the Congress-led 56-party ï¿½Mahagathbandhan' here. "You (Modi) will keep on abusing Nehru and Indira Gandhi, but still you copy themï¿½ Past five years you have only lied to the country on everything," Thackeray roared. He also touched on Modi's oft-repeated allegation that nobody from the Congress family went ot visit Bhagat Singh when he was in jail awaiting the gallows during the freedom struggle. He played Modi's earlier speeches on the topic and produced an old newspaper clipping to buttress his argument that Nehru had actually met Bhagat Singh twice in jail. "Now, what does he (Modi) mean by Congress family? Was it Gandhiji's family, Nehru's family, Patel's family, Maulana Azad's family, or Sarojini Naidu's family? If it was Nehru's family, then he had visited Bhagat Singh twice in prisonï¿½ and it it is Indira's family, she was barely 14 at that time. The question of Rajiv, Sanjay, Sonia, Rahul and Priyanka's family doesn't arise," he declared. Saying that Modi and Bharatiya Janata President Amit Shah were "dangerous" people, Thackeray warned that if they returned to power, the whole nation will be reduced to their slaves. He added that nobody would be allowed the freedom of free speech including the media. Thackeray, who plans to address around 8-9 rallies more in the state, has become much sought after - along with Nationalist Congress Party's Dhananjay Munde - by all opposition parties to boost their electoral prospects.